The combination of Parmesan cheese and chili powder gives a spicy flare to this grilled sweet corn. The grilled flavor is the perfect finishing touch that makes this sweet corn a great match to your favorite grilled burger. 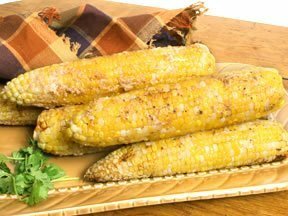 Add this corn on the cob recipe to your menu for your next backyard barbecue with family and friends. Learn how easy it is to freeze your own corn with our step-by-step instructions. You will also find many methods for cooking sweet corn. Our All About Strawberries information will guide you through the steps for freezing strawberries using several different methods.